Here are 27 must start online business ideas to start in 2019 for those with some online, design, coding and marketing experience. These ideas are purely online based as opposed to physical retail businesses that may have higher running costs. These ideas are based on services I believe are in greatest need. For the e-commerce, drop shipping and affiliate marketing ideas I have summarised who the business suitable for, what’s involved in starting up, the opportunity analysis, a business forecast, the risks, a start up strategy and likely costs involved. I never actually started a blog, I started a website to showcase my website work, then tagged on a blog to write helpful articles. To start a brand new blog, here are the steps involved. Step 1 : Write down blog topics or niches you’re interested in eg: golf, skateboarding, ski-ing. Step 2 : Ask yourself if you could write about places, equipment or the industry. Step 3 : Use keyword research to find blog content ideas. Step 4 : Analyse the traffic of competing blogs and websites. Step 5 : Choose business models below to monetise blog . Step 6 : Write 10 blog articles. Step 7 : Buy a domain name at 123-reg.co.uk. Step 8 : Buy WordPress hosting and theme. Step 9 : Structure website into blog categories. Step 10 : Put website live and promote. Step 11 : Reach out to industry peers and ask to review a couple of products to earn niche credibility. Don’t expect to make money in the first couple of years from a blog unless you have hired content writers and invested in promotion and link building. The idea of selling your book on Amazon or other digital platforms isn’t to make money. The idea is to communicate your expertise and authority in a certain field. You need epub and mobi formatted books; .epub is a format for reading documents on phones and tablets, computers and electronic readers and .mobi is a format for Kindle books. Then write and produce your book with Reedsy. If you don’t want to give Amazon exclusivity then use https://draft2digital.com/ this will open up your book distribution with iBooks (Apple), Barnes & Noble, Kobo and Google Play. Do your homework and ask an expert about the best distribution, pricing and margin strategy for your book. I did publish a link building book with Reedsy; purely because I couldn’t find a nice PDF design in Word or Google Docs. I tried to sell my eBook myself with PayPal and Stripe as the payment processor. Sales didn’t go so well so a better blend of product, price and distribution required in future. I started an SEO membership programme in September. The idea behind the membership is to teach people all the elements of SEO. The subject matter changes over time so a one off course purchase would not have been in the customers best interests. I have good traffic to my website each month and have built up around 1200 active users on my email database. And still attracting members is tough. But don’t let me dissuade you. The need for education is strong as long as you match the right topics to teach with the right audience. As simple as this sounds you can write an article or guide in Google Docs, save and download it as a PDF and sell it. Now you need an audience to sell it to and the means to process an order and deliver the document download. There are software solutions such as Podia and Gumroad that make the digital download process easier but charge you a monthly fee. Online marketing is becoming more fragmented so much so you need an expert for most of the major advertising channels. You most likely need an expertise that specialises in Facebook advertising. 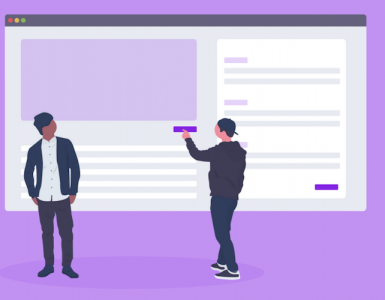 The range of ad campaign options are growing and becoming more complex that only an expert working on Facebook ads or paid advertising exclusively can create campaigns that deliver on your objectives. SEO is the number one traffic source for most websites and the most talked about. SEO is the science and art of ranking web pages in the organic positions in Google. Most SME and larger organisations have dedicated SEO Managers in house as well as hiring an SEO agency to support with the implementation work. 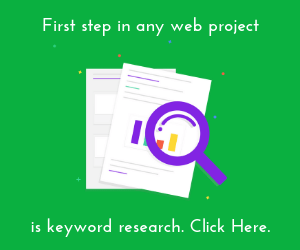 Research – find out what people search and click. Competitor analysis – find out what your competitors rank for and their link strategy. Content production – produce content based on research to serve the end users needs. On page optimisation and UX – making sure you write the page so it can improve click through rates from the search results and enhancing the user experience of the page when they read it. Off page optimisation and link building – strategies to earn valuable links to page (since links are the number one ranking factor). Conversion – strategies to take the visitor from organic search to the next page, a form, a product page or a basket. Analysis and strategy – figuring out how to grow more organic traffic or fix issues to improve traffic. SEO is not a skill you learn from a book or a course; you learn from experience of actually working on websites and SEO campaigns. 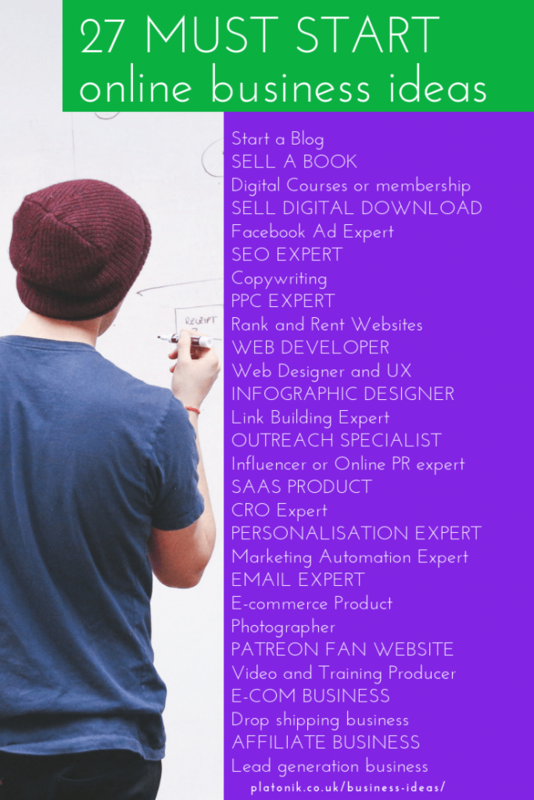 A quick look at Who’s Hiring for SEO Experts and you’ll find salaries in the range of $120,000 per annum for the real experts. And in this day and age creating your own website and SEO is a must if you want to get your foot on this ladder. Copy refers to words that are written for advertisements, brochures, manual, technical guides, instructions, sales letters, sales pages and websites. The discipline is very broad and to succeed you will need to specialise in a particular industry sector eg: finance. In addition to great writing skills you will need good product knowledge as well as understanding what the user will want. Copy for an advert will differ in format and length from copy for an instruction manual. Historically copywriters learned their trade in advertising agencies and today there are thousands of freelance copywriters. To get started in copywriting, I would start reading its bible “Confessions of an Advertising Man”. Copywriters are people who write the text you read on brochures, websites, product guides, instruction manuals, blog posts and advertisements. In my opinion copywriting has evolved into search engine optimisation as great content written around keyword research is a major key in generating visibility and traffic from Google. Who is a copywriting business suited to? Ideally suited to anyone with a flair for research and persuasive writing. I would recommend you have some kind of industry knowledge that you can leverage so that you can sell your services back to companies in that industry. If you have a medical background; then target doctors, dentists, pharmaceutical companies and websites. Starting as a copywriter would be a good part time opportunity for a stay at home mum or even a student. You can register with websites such as iwriter.com and textbroker.com and bid for work people request; so to start you don’t even need to find clients. Although the rates are very low. There’s a company called Fatjoe.co and they generate around 23,000 visits a month to their website and charge around £60 for a 2,000-word article. I’m under-selling this business opportunity here. When ever I’ve used a copywriting service it is for copy for a new website. Typically, I’ll order 10 to 15 articles. What’s involved in starting a copywriting business? All you need is a laptop, a phone and the ‘gift of persuasive writing’. I would recommend that you invest in Brian Dean’s SEO That Works course. The training course will teach you the higher value service businesses are looking for; people don’t want a copywriter they want traffic from Google. Brian has some proven copywriting frameworks and a tremendous Facebook community group. I believe you need to gain an understanding of the value of organic traffic to a business. I know graduates of Brian’s course are charging between £500 and £1500 for one page of in-depth copy; although this is an exception not a rule. Here’s the keyword research we’ve done. This is a fascinating and growing industry; notice the monthly searches have nearly trebled in a year from 3600 to 11000. I shall need to look out the research but content marketing spend is growing hence the need for copywriting is growing. However the search query has also become more difficulty to rank for. There’s 2795 same as searches to copywriting so you need to drill down into these queries to identify an easier to rank queries. Look for phrases such as content marketing, guest blogging, article writing and copy for specific industries that you specialise in. Or use a keyword research tool to reverse engineer a copywriter’s website to see the pages and keywords they rank for. So let’s say you can generate 1279 organic visits per month. It’s going to take time to build up to that level of traffic. Assume you get 2% of the visitors making an enquiry. Assume 10 of those people decide to use your services. Let’s say you get to commission 2 articles at £300 each. That’s £6000 a month income. One of the main risks is that most companies think they can write copy themselves and many don’t value the investment in professional copywriting. It has taken me one working day to write the drafts of ten 600 word articles. To write a 2000-word article on a specific blog topic can take 4 or 5 days’ research, writing, edit and client approval. That’s why I recommend starting and positioning a copywriting business as a higher value SEO service and taking Brian’s training. Get a nice looking website template and write your own copy around the keywords you’ve identified as fairly easy to rank for. Pay Per Click Advertising has exploded in recent years as Google and Facebook have expanded their product range. One area within PPC is Google Shopping Ads. If you sell fashion or products online you will not succeed without Google Shopping Ads. Look at this search result for mens tweed suits. 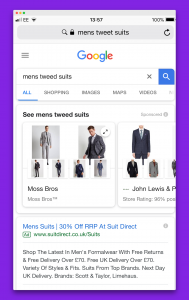 The Google Shopping Ads appear at the top of the page with the images. Underneath are the standard text adverts. Now look at Google Shopping Ads on mobile devices. 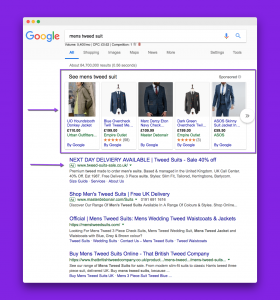 This data shows that 42% of clicks for the search “mens tweed suits” come from paid results. So if I were to specialise in PPC as a freelancer, I’d first get PPC or digital agency experience. Then I’d target Shopify and BigCommerce powered websites and specialise in Google Shopping Ads as these will deliver the client’s their best return. Glenn Allsopp exposed me to the idea of ranking a website in Google and renting it out. I’ve never tried it but it’s an interesting business model. I’ve worked with so many clients that take forever over a design concept, can’t write relevant content and generally take nothing to do with a website after it’s launched. If I pursued this business model, here’s what I’d do. Write 10 pages on content. Use one of my favourite WordPress themes with has ad space built into it. Put a call to action form on the website to capture leads. Put some basic link building in place to earn traction in Google. Put re-marketing code into site. Once I’ve got traffic and leads then I’d reach out to prospects. For a period of time, I’d offer to change the logo and colours, add some more content, let them have the leads and run a retargeting campaign on Facebook and Google for them. I’d still own the website and the monthly fee to them wouldn’t be cheap. Here’s where I see web developers going; create website themes and templates. Jason created MuseGrid.com and sold Adobe Muse templates to web designers until Adobe plugged the plug on their platform. I use web developers at MeksHq.com and they have some wonderful WordPress themes. I honestly love to collaborate with them in developing some more commercially oriented themes. Look at Shopify themes; they are all created by web developers and the margins and profits are great. You can sell through Shopify, your own website and via ThemeForest. 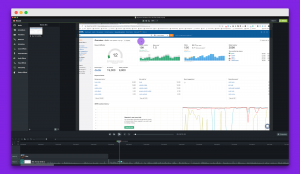 I’m sure that web developers are already creating themes and templates for the growing Webflow platform. There’s also a huge opportunity in paid for WordPress plugins and Shopify Apps for web developers. With so many do it yourself platforms such as WordPress, Wix, SquareSpace, Shopify and so on, web design prices are a race to the bottom. If I were a designer, I would specialise in the user experience; UX. I hired Ben to create a unique web design for a client; he got paid handsomely. If I were a web designer I would learn Webflow; that’s the platform to build responsive website experiences on. I’d target web agencies and pitch them your freelance experience and portfolio. An infographic is a image that explains complicated information easily. They are very popular additions to websites and are very useful in helping websites earn links from other websites. There is a huge infographic industry and it’s definitely an area that a designer could specialise in. Of course you can create an infographic yourself using these platforms. If I were good at design, I’d target SEO agencies and managers with my infographic design skills as these people will be your target market and main buyers. They will pay for custom infographic design as part of their link building and promotional campaigns. I’ve mentioned that links from other websites to your web page are the number one ranking factor. And most SEO experts and agencies know this. A link building expert is a marketer who can analysis a website, competitors and the industry and conceive a link building campaign to boost a website’s domain authority, rankings and traffic. Here are the 4 main types of white hat link building campaigns an expert would work on. Here’s an example of a broken link building campaign I worked on. A link building specialist will typically work on a project fee basis or an hourly rate; never on a links acquired basis. An outreach specialist works In tandem with a link building or SEO expert. Once you’ve devised a link strategy and identified the prospects to target, then you need to reach out and communicate with them. Identifying prospect on social channels. Finding the name and email of prospects. Crafting a first contact with the prospects. Crafting first email and message to prospects. Nurturing a dialogue with the aim of achieving a link to the client’s website. Before the internet, I worked for companies who hired a PR company to get their products featured in trade and consumer magazines (as opposed or in addition to paying for advertisements). My employers at the time paid for the PR consultants time and expenses. PR and editorial featured were considered more valuable than an advertisement. Since I started my career in the golf industry, I’ll explain how PR worked then and how influencer marketing works now. So a golf company launches a new product. The PR agent reaches out and pitches the idea to golf magazine journalists. They like the idea of this product being tested with lady golfers. So they produce a testing day, video it, talk to golfers, take photographs and capture user feedback. This information is then used in an editorial feature in the magazine with the aim of influencing other lady golfers to consider or purchase this brand’s product. 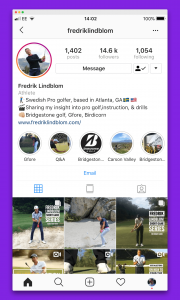 Now fast forward 20 years, there’s a golfer on Instagram called Fredrik Lindblom. He’s a Swedish professional golfer based in the USA with 14,600 followers on Instagram. Being a golfer I love the content he produces. He documents his journey of improvement, his scores and his journey to the top of the golf ranks. He also produces a series of instruction videos. And, to supplement his income, he will feature and promote some golf related products to his audience. He’ll get a product sample and brief from a client, talk about it and promote links to that company’s product or website. So, to be honest, influencer marketing is just a fancy modern phrase for PR – promoting your product to the public. SAAS is an acronym for Service as a Software. You create a solution to fulfill a need and charge users a monthly or annual fee for use of the service. For example, SiteGlide is a website and online marketing service for digital agencies to create websites and digital marketing campaigns. Canva is a SAAS platform to help users create social graphics and other marketing collateral pieces. They tapped into the needs of users who found that Photoshop was hard to use for these type of images. 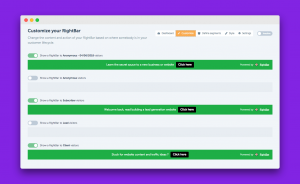 Right Message let’s you personalise your website with their suite of tools. The investment required to create and sell SAAS solutions is huge but the returns can be great. Conversion rate optimisation is the art of improving conversion rates on lead generation and e-commerce websites. Better conversion can have a huge impact on leads, cost per acquisition, cost per sale, revenue and margins. There are so many variables that can affect conversion rates so what experts do is test one variable, measure the differences and implement the best result. This is called A/B Testing. You will need a wide range of in depth online experience before moving to CRO roles. Again your best starting point is with a web agency or CRO solution provider although freelance is an option. Whether or not you are a registered member of Amazon or not you will be exposed to marketing personalisation. If you look at any products or services they will show you previously visited products. If you buy a book, you will be emailed similar book choices in the future. I’ve just visited Amazon writing this article this morning; look at how Amazon are personalising their website for me. I’m not saying it’s perfect but they know me. Marketing personalisation for those will smaller marketing departments and budgets is being lead by a product called Right Message. 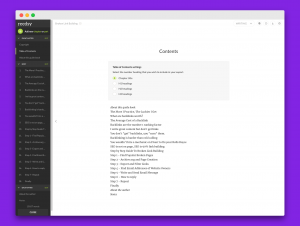 You can show different text and headlines on a page depending on the users’ job role. You show a different message at the top of a page depending on how you’ve segmented your audience. I can show one message to new visitors, one to previous subscribers and one to clients. That’s only a brief overview of marketing personalisation but it’s definitely a growth area and opportunity. Experts in marketing automation use software to set up pre planned workflows to achieve an end result. 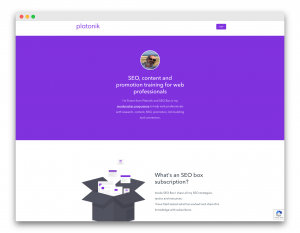 I started a membership website and set up a workflow that would send my existing email subscribers who visited a certain page a follow up email one day after the visit if the did not buy and join. Then my workflow waited another week and sent a discount code had they not joined. 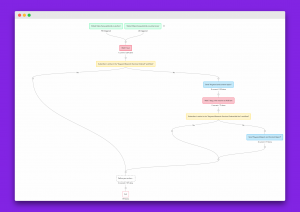 Here’s an image of the workflow. The UK supermarket chain store Tesco pay a £40,000 a year salary to their email marketing managers. This is obviously top of the food chain salary but email marketing is a major sales channel for online retailers. For this small online store, email marketing accounts for 17% of their year to date online revenue. Those, like myself, who have a marketing degree and learned that your most important customers are those that spend recently, frequently and the most. Look up RFM – recency, frequency, monetary. So email marketing requires much more than simply blasting out an email to everyone on your list. Tool such as MailChimp have developed over the years that allow you to use AI to suggest products to these customers. Email marketing is more than design and delivery, it’s about customer and business insight and having the segmentation tools to pinpoint those customers to send the right offer to. One of the biggest investments an e-commerce retailer will make is in product photography. There’s a saying in fashion; a fashion picture isn’t a picture of a dress it’s a picture of the women who wears it. In other words, if you want to sell products online those products must be shot with real models wearing the clothing. Photographer and models aren’t cheap. In house studio and lighting. You’ll need a stylist or someone to set up the models and shots so they are consistent not only throughout the shot but also across the entire website. Photoshop for editing and touch up. Then upload images and match them with the products on the website. There will be a lot of to-ing and fro-ing with models, marketing and merchandising teams so you need to have good stress levels. Glenn Allsopp talked about Patreon in a blog post last year and I had never heard of the platform. That was until I discovered a fan site through a YouTube video. 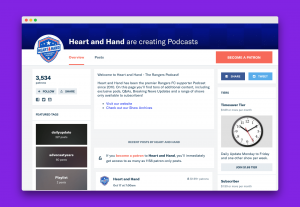 3540 fans of this Scottish football club pay the host £1.99 a month for access to the site’s content. Not a bad little revenue stream. Patreon as a website has over 5.1 million visits from organic search, according to Ahrefs, so it’s got a huge audience in itself. I’ve been using software called Camtasia for about 8 years. I use it mainly to produce videos to demonstrate website issues to my web developers as well as support videos to clients. 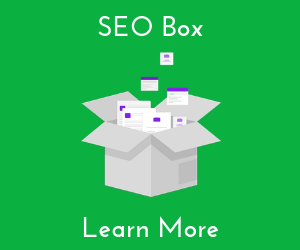 In addition I produce video content with Camtasia for my SEO Box membership programme. If I were to solely focused on video production I would target SAAS companies and digital agencies who need help with product explanation and how to videos. Then I’d repurpose those videos for consumption across multiple channels including YouTube, Facebook, LinkedIn and Instagram TV. Selling products or services online is typically called an e-commerce business. If you sell products you typically need to order, purchase and hold stock before despatching to customers. There is a huge financial commitment and risk to buy products or make products before customers order. Selling a service is also classified as an e-commerce business although these are sometimes called SAAS businesses. Find a supplier with a low minimum quantity. Now check that they can customise the products with your branding or preferred colours. Buy some samples and test them out; for clothing, put them in a washing machine for 7 straight days. You will need to factor in printing and branding plate costs. Then you need to calculate your landed cost. The cost per product you see on Alibaba is not the cost to bring the product in the UK. You have shipping costs, customs and duties costs, docking fees and payment transfer costs. I have a client that’s had problems sourcing products from the Far East; poor sample quality. Sourcing products internationally and running an ecommerce business is not a quick fix business model. Now you need to do your research and find out what prices competitors are selling at. Pop your keyword into Amazon and try and find the average retail price. Your rule of thumb in marking up your cost price to retail price is 3 times. Your markup has to cover your margin, cost of selling, storing, wastage and other operational expenses. Let’s start with one of the opportunities I found. The average page in the top 10 results gets 2638 organic visits per month. With 2404 search terms similar to bathroom mirrors there is good product type to exploit online. There are plenty of manufacturers of steam-free, LED, illuminated, him and her, shaving mirrors that would willing work with you and their premium mirrors to get traffic and sales for their products. I looked at the Bathstore page for LED Mirrors, sale price £239 and I looked at Victoria Plum’s page. There’s definitely opportunities to create product images that do a better job of selling these premium mirrors. If you’ve ever seen the Nivea advert using Liverpool FC footballers, that’s how you convey mirrors. There’s a saying in fashion “a fashion photography is never a picture of a dress – it’s a picture of the woman who wears it”. I recommend putting a photography of a man shaving at the mirror or a couple putting the finishing touches to their hair or makeup before they go out for the night. Then you have a better chance of persuading the consumer to purchase mirrors. The website you would be trying to oust, hotdoors.co.uk, is a very attractive, well merchandised website. The hotdoors.co.uk website was developed on the Magento platform; that’s a large investment in their web presence. Whilst these guys are merchandising replacement kitchen doors, I believe the bigger opportunity for you lies with replacement or new kitchens. You are absolutely going to need a sample delivered to ensure the replacement matches what the old kitchen door the user currently has. So I believe the consumers conversation in their head is “I’ll get replacement doors but I know deep down that I’m going to have to replace my entire kitchen in the near future”. I call this the scratch in the car marketing problem; you don’t replace your car if there’s a scratch but when things stop working or you need replacement parts you are close to purchasing a new one. 24 referring domains is fairly difficult for you to earn if this opportunity interests you. There are plenty of home improvement bloggers you can cultivate relationships with. The average page one result gets 729 visits per month. So whilst the revenue and margin from replacement doors will not be huge; putting together a fantastic website to showcase replacement kitchens is the way you’ll make margin; provided you can find a good supplier or manufacturer to fulfil the customers order. A wood burner is a stove used to heat a home with fire wood. Very popular with people who don’t have access to gas as an energy source or like the aesthetics of a flame lit room. Burning fire wood is the lowest energy method and thousands of homes a year in the UK are switching to wood burning stoves. Look at Glowing Embers page and you will see the content they have. Don’t be fooled by the page content; there are 2050 words on this page with expert knowledge and great content. You better know your stuff if you want to rank for this keyword and devise content that’s even more helpful. The search volume for wood burners has dropped from 9900 to 5600 searches per month in 16 months. I’ve loved to know why. The average page one result gets 5051 visits per month from Google. That’s huge potential to see wood burners online nationally. Even so, with 1549 same as search terms this is still a large topic and business opportunity. This is a lesson when doing online research; don’t just look the searches per month look at the clicks to the top pages. There is an opportunity to start a coffee business based on the keyword research I’ve done. Last year I recall, before I met my client, I was waiting in their office reception when I was offered a cup of coffee. The receptionist made the cuppa with a bean to cup coffee machine. She wasn’t very pleased with the machine. Do a Google search and you’ll see coffee machines vary in price from £129 to £1699. A former client sold commercial coffee machines to restaurants and hotels and those Italian coffee machines started at around £5999; from recollection. They had a relationship with an Italian supplier with sample machines in their showroom but did not hold any other stock; they drop shipped. Who is a start up coffee business suited to? I believe there are two different business opportunities here. One involves face to face selling by someone, perhaps a sales rep who is currently calling on offices, businesses and even hospitality businesses. Using my keyword research you should set up a website to sell product. So for a sales person with an existing portfolio of products this would be a great add on service if you found the right supplier. Alternatively, a website selling bean to coffee cup machines directly would work. What’s involved in starting up? Other than your web site related costs there are very few other costs involved in setting up this business. This could be done on a part time basis, on the side; ideal for students, stay at home mums or anyone with good digital skills. Most importantly, this opportunity is suited to someone who is knowledgeable and passionate about coffee. You will want to have some product knowledge about coffee beans and about alternative machines. This is still a competitive market which is why the research I’ve done is so valuable to someone just starting up. What does this research tell you? There were 5100 searches per month for ‘Bean to Cup Coffee Machines’ but that’s up 20% since I last researched this 6 months ago. This is a large enough topic to target with 193 search phrases that include bean to cup coffee machines. I would recommend setting up a Shopify e-commerce store. Source images and product descriptions from a supplier that will work with you on a drop shipping basis. Then create and write your own unique content. Let’s say you can outrank the weakest site in the top 10 and get 2217 visits a month. A product priced between £129 and £699 is going to have a low sales conversion rate. Let’s assume 1% of visitors purchase. Let’s assume you can command 20% commission from the supplier to operate on a drop shipping basis. Take the average order value at £300. That’s monthly revenue of £1320. I believe there’s also an opportunity to sell servicing of the higher priced coffee machines. You might strike up a relationship with the manufacturer who have a team of field based engineers who can provided the servicing. When you’ve acquired the customers, then start offering consumables; whilst the order values will be lower, they will be more frequent. Let’s say the business doesn’t work out. Let’s say you aren’t able to negotiate favourable supplier terms or the supplier decides to stop working with you. Your investment is not wasted. There are websites such as Flippa that enables website owners to sell their website and property. If you’re able to have a well designed website with the traffic I estimated, you will more than get a return on your investment. Compared to a traditional retail business the start up costs for an online coffee machine business are fairly low. Hardly surprising that ladies clothing products generate a lot of search volume. I’m not one for fashion so you’re going to have to do your diligence with sourcing products and really knowing your market. As you can see from the research below there are 18,000 searches a month for over the knee boots. More importantly the average page on the first page of Google gets 3640 visits per month. With a good product design, I’m sure ladies would willing pay more than £36 and with a good product range, this opportunity could be the catalyst of a great e-commerce business. I thought the search volume would be higher than this but I suppose football participation isn’t as high as it used to be. Your market will be 20 and 30 something men that play football in the evenings and weekends or kids. I’m certain any entrepreneur starting a football equipment shop online will create a larger product range including socks, shirts, shorts, shin pads to create a wider product selection for customers. This is an interesting opportunity with good search volume and clicks to capitalise upon. Even in Scotland there are plenty of quarries that can manufacture concrete slabs for you or you can source from merchants or wholesalers. The average page on the first page of Google gets 3814 visits per month. Obviously this is the national search and click volume where majority of interest will come from the south of England. Whilst slabs are heavy there are plenty of delivery companies that deliver heavy products nationally. I’ve worked with a number of e-commerce business that sell heavy product; drop me an email and I dig out those couriers. 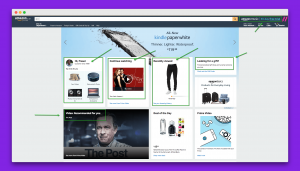 This is a commodity market that is going to be price sensitive but if you can capture page one rankings a good e-commerce site and user experience can convert that traffic and interest into sales. 8600 searches per month for laminate flooring and the average page one results gets 9127 visits per month. 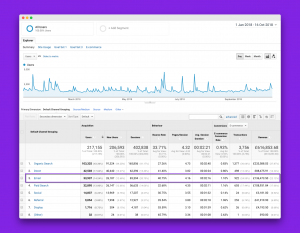 When you see more clicks than searches that’s because a page result is ranking for lots of similar keywords or people are visiting these search queries multiple times per month. This opportunity tells me that people are visiting a lot of websites to find the products they are looking for. I’ve purchased laminate flooring in the past and whilst you want cheap you really want durable, long lasting that doesn’t chip or break. Flooring is sold on a per metre squared basis so this is an opportunity for someone with a lot of DIY or industry experience. Pop your keyword into Amazon. This product is priced at £14.99 per metre squared. Garden furniture is a very seasonal product to sell; April and May are the peak months. So ideally you want to choose products can aren’t fashionable and can last 3 or 4 years. Even in September as I write the results on page one in Google get 23,400 visits per month. The types of products you want to be sourcing are table and chair sets for patios, benches and sun loungers. You can easily find suppliers in the Far East or via Alibaba that will supply you. So when you’ve used the garage for your car or converted the garage into a 5th bedroom or office then you need somewhere to store your lawn mower and bikes. Again, heavy products to import so I’ve investigate different manufacturers in southern Europe or the Middle East. Alternatively, use this opportunity for an affiliate marketing website and de-risk investing in sourcing heavily products. Some basic maths for a garden shed e-commerce business. I’ve not done any research on the cost price; my gut instinct tells me the margins won’t be high. Woohoo ! slippers for women. Mums and wives just love their slippers and make ideal presents and gifts. Here’s the research I’ve done. So there’s 7800 searches a month in the UK for ‘slippers for women” and the keyword difficulty is very low; 3. In other words, if you can create a very relevant page about slippers for women, better than currently ranked pages, and earn 2 or 3 links to this page you have a good chance of breaking into the top 10 in Google. Looking at the top 10 results. So let’s assume you can rank your store in the top 10 for this product, you’ll earn, on average, 7812 organic visits per month. Now let’s assume 2% of the visitors to this page will buy. That’s 156 sales per month. Let’s say you design and create a premium supplier and can sell it for £59. That’s monthly revenue of £9204 and annual revenue of £110,448. There’s usually good margin in footwear and plenty of suppliers. Selling ladies slippers is not going to make you a fortune but it will help you to set a realistic expectation of what stock volume to order. So apparently this type of headphone is very popular and is used for those with a hearing impairment. listen to music, watch Netflix on their phone or tablet. So, a good market size and a good problem these products can help with. Obviously 543 visits a month for the bone conduction headphones it’s very much. So I’ve researched all different searches for headphones; for runners, for golfers, noise cancelling, wireless and so on. This is a huge market as people seek to cocoon themselves in music and audio. What boy does not want an electric car? This product makes an ideal birthday or Christmas present for the young ones. Decent margin, double your cost but car brand name is going to be important in the purchase selection. One variation on car brand name would be to tap into licensing characters that kids love and may the licence holders a royalty per sale. Some basic maths for selling kids electric cars online. I’m not sure about the mindset of adults wanting an electric scooter but there is obviously demand for the product. These types of scooters are geared towards kids and I’ve seen these products being used. The base of the scooter separates so that each foot has it’s own platform. Some basic maths for selling scooters online. These are obviously large products to import from overseas but the search volume and organic clicks are high. I was approached earlier this year to do some keyword research for a prospective customer who launched an ecommerce affiliate store. There’s fairly good margin in this product line and a large market. Some basic maths for selling beds online. There’s around 700,000 to 800,000 thousand births per year in the UK and the market for this product is for pre walking infants. Parents and grandparents are the market and there’s a reasonably good margin importing this type of product. You’re going to have to test this product thoroughly and adhere to stringent safety regulations as well. Some basic maths for selling baby bouncer chairs. of wheels they use or to find any issues or opportunities they have. You’ll need to look at compatibility with UK cars and wheels sizes and investigate any safety regulations. Some basic maths for selling alloy wheels. One of my mates had a bouncy castle side business in the early 90’s to supplement his day job. And by all accounts the business was very successful. The people making a search for this may be kids fun centre owners, operate an entertainment business or wealthy parents seeking a permanent bouncy castle. There was an advert on Facebook today with a company selling bouncy castles for your garden in the design of a pub ! How cool. There have been a few human disasters pertaining to bouncy castles so red tape will be huge as safety is paramount. Some basic maths for selling freezers. Dropping shipping can be a successful and profitable business model. In truth, you don’t have to make as large a financial commitment stocking products to sell like a retailer would. Whilst you make a lesser margin than traditional retailing you can start small and make a profit by marketing and selling some one else’s products. The key to success is finding product keywords during your research that you are confident enough to promote and write about. And finding a supplier willing to work with you on a drop ship basis. Without identifying easy to rank keywords you won’t get any traffic for a drop shipping website. There has to be more places to buy a sofa bed than Ikea ! The idea is to find a unique angle to write a review about sofa beds. There’s a page called the Sofa Bed For The Epically Lazy; now that’s how to grab some attention. Some basic maths for selling sofa beds. There are 5900 searches a month for cheap furniture uk. The average page one result gets 2564 a month. For an affiliate website there are so many angles to this opportunity. My suggestion would be to write a guide to buying cheap furniture for your first time home buyers. Alternatively, a guide to cheap furniture for a teenagers room. Some basic maths for selling furniture. The choice of fridge freezers is overwhelming, so here’s what I would do. Go into an chain of electrical stores and pretend to be interested in buying a fridge freezer. The sales guys are the most knowledgeable on products and will tell you the features and benefits of different models. Turn on your iPhone voice recorder and record the conversations then transcribe the notes. Then get the sales guys to recommend a fridge freezer at different price points. I know this strategy is a little devious but I’m a capitalist ! 5000 searches per month for white goods and page 1 result gets around 12515 visits per month. This is one of the new ideas I researched to improve this resource. I started to look for very high priced products being sold online. There are summer houses being sold for more than £10,000. So if you have a high purchase price, you have a higher commission per sale. There’s 9100 searches for summerhouse and 1775 similar search terms. Hence the average page in the top 10 gets 7074 visits a month. A garden igloo is just a fancy structure that can used in your garden. The cool thing about it is it’s portable; not fixed like a summer house. Prices vary between £849 and £18,999. A nice little product as an add on to an existing electronics or technology retailer. your own to see if this is an emerging product or not. Some basic maths for phone accessories. I mentioned CCTV opportunities in my business ideas post. This is a small niche opportunities; again an add on to existing technology retail business. The market would appear to be the DIY enthusiast who wants to install CCTV themselves at home. This is a business start up opportunity that arose from some personal experience. My parents had a company install CCTV a number of years ago and it cost them over £2000. The installation occurred after an incident happened and not before. A few years ago CCTV was exclusively for retail stores, businesses, company offices and warehouses. But today, home-owners have CCTV installed for home security purposes. Who is suited to starting in home security? Ideally someone with IT experience such as an IT manager or someone running an IT related business; even a computer retail shop. Start up costs for this business are low and you should start by getting friends and family interested in you installing domestic CCTV systems for them. There are no data protection requirements for domestic use and the cameras can only be pointed at the home owners’ property; so no peering into the neighbour’s garden or driveway. You would charge an installation fee or perhaps add a mark up on top of the equipment prices. I know my parents have a monthly plan that covers so many call outs should there be a problem with the equipment. The other start up opportunity is to sell CCTV equipment on a drop shipping basis. That means you set up a website that sells cctv kits and the supplier delivers the goods to the home owners address. You make less profit but you don’t need to purchase and hold stock hoping a customer will purchase. Our method of finding opportunities is to do keyword research and identify highly searched keywords with low competition. The search phrase ‘cctv kits’ is the ideal search phrase someone starting in home security or selling home security equipment wants to rank in Google for. There were 6600 searches a month in the UK but that has increased to 11000 per month in 16 months for cctv kits. With 475 same as search terms this is not a huge topic however the average page one website is getting 3100 visits per month. Therefore, it is fairly easy to outrank with good website content and high quality links pointing to it. Therefore, the best business model is drop shipping; you make a margin for ranking good page content and selling other manufacturers products. You will be reliant upon suppliers working with you, an unknown entity, on a drop shipping basis. Assuming you could create a website that will outrank the weakest website in the top 10 search results; assume 3100 visitors a month. Assume the average order value is £300 and you strike a deal with suppliers to take 20% of the revenue; that’s £60 per order. A 2% website visitor to conversion rate is 62 orders per month. Estimated monthly revenue projection would be £3720 per month. This appears a good return on investment. But it may take you 3-6 months to design, create content and build a good backlink profile before you start to see this type of organic traffic coming from Google. The 3rd type of online business is called affiliate marketing. You are basically recommend other products and services on properties you own (where you can add a tracking code) and you get a percentage of the sale if they eventually purchase. Drip is my email marketing, web form and automation supplier. I just signed up to their affiliate programme. Not that I intend to make much money from it but as part of a demonstration to other web professionals about the power of the software. I understand it’s around 15% of a $49 a month subscription. I had a lot of success with Quuu Promote last year. They help me promote my content and articles to a wider audience. This helped me earn shares, clicks and even backlinks. So yes I’m part of their affiliate programme. They pay 25% of a customers monthly subscription. 25% of $40 or even $100 per month isn’t much. This website is hosted by FlyWheel and I recommend clients host there too. If you want to sell online, the Shopify is your solution. I’ve been right through their journey but chose another platform who paid my 20% of my client’s monthly hosting fee. I provide website and content planning services and my website’s sole purpose is to generate customer enquiries. That’s why I have a contact form on the right side of every page and a form throughout most blog posts. The following are some online service and lead generation businesses I’ve discovered as part of my research. An EPC Rating tells you how energy efficient your home is and is required if you buy or sell a house or if you are considering solar panels or heat pumps. Estate agents, homeowners and home buyers need one. You can either build a website and sell the enquiries you get to energy related companies. Or you can take training and become a domestic energy advisor yourself. Or a hybrid of both; do the EPC’s for local enquiries and sell the non local enquiries. The key to this idea is knowing who to sell the leads to and how to create a website that can maximise conversions. You will find the buyers on energy related groups on LinkedIn. Who is this idea suited to? This is an ideal opportunity for an energy company or someone who wants to set up a rent and rank website and sell leads to various companies who do EPC surveys. If you are going to set up a website and sell the leads, you are going to need some industry and product knowledge. Most of that can be found online. If you want to train and become an DEA it will cost you £800 plus vat. You’ll need a car and you’ll need to find a company who want EPC ratings done. Doing keyword research is essential for any new or start up business. There were 8100 searches a month for EPC Rating but that’s increased to 17,000 in 16 months and whilst this is an informational search it is ideal as a small business opportunity. On the downside this is a harder to rank keyword now that 16 months ago. topic to explore in more detail to capitalise upon. The income from a EPC is around £120 to £200. You sell the leads for £20. Even if only 50% take an EPC that monthly income of £7594. Let’s say you also become a qualified DEA and 10% of the enquiries you can survey. So the potential is £10954 per month. I’ve a client in the industry and they were dependent on government policy and green deal funding. I believe the industry is more stable now but you should do your due diligence. This is a low risk opportunity. I would get a low cost website template but with a good design and create some create content. Good content is key to this website. After that you need links to your website. There’s plenty of bloggers and influencers in the home improvement market that would link to the right type of content to boost your backlinks. A photo booth is a unit that companies or groups rent for parties, graduations, wedding events and birthdays that lets people take impulsive group photographs in the style of passport photos. Think of these photographs like group selfies. The owner of the photo booth either charges a hire fee or provides the photo booth free of charge to the event organiser and charges people for the photographs they take. Who is an events business like this suited to? Starting a photography and events company is ideally to a photographer or entrepreneur who wants to broaden their business wings. However, my accountant had a bouncy castle and events business during his university years so there’s no hard and fast rule on suitability. You are going to be working unsociable hours when everyone else is having fun; so the right personality counts. You better be a good problem solver; I worked corporate hospitality events for 3 years and you have to plan for every eventuality. And expect your adrenaline levels to go on a rollercoaster ride. Since the start up costs are higher than other ideas I’ve proposed, you will need two things. Decide your pricing model; hire fee per event or charge for prints. I’ve looked at a competitor and they charge a hire fee per event. You are going to have travel costs, staff costs and other variable costs. I’d recommend working on a spreadsheet with different cost and revenue projections. The next thing you need are bookings and enquiries. And this is where the keyword research I’ve done is vital. There were 12,100 UK searches a month for Photo Booth Hire but that’s declined to 6800 searches a month. There has been a drop in searches from 12100 to 6800 per month in 16 months. Could it be that photo booths were a fad ? I would probably rule out this as a business opportunity but hire me to do some more keyword research; perhaps looking at products you could import to start an e-commerce business. Then there will be a time lag the enquiry and money in the bank. Bear in mind it’s going to take 6 to 12 months to start realising organic traffic from Google. I don’t think this is a business for life opportunity as I believe it’s a young man’s game. However, the business may lead to other opportunities. I believe the equipment will have a limited life span and new concepts will come onto the market requiring further investment. The downside is that the investment in a photo booth is high and you will need to have a good grasp of digital photography and have great customer service in taking and fulfilling orders. You will want to budget at least £10k to start up a photo booth events business. Starting a business to teach guitar caught my interest since my son plays guitar. We sent him for weekly lessons with a guitar tutor for about two years. There after he started learning songs from YouTube. To grasp this idea, you will need to be a great guitarist or you could be a videographer or photography and team up with a guitarist as a joint venture. The lessons and content would have to be superb. Obviously you need to be a great guitarist and teacher to be able to sell training to beginners. There is a fantastic series called MasterClass.com that sell classes from experts. People like Kevin Spacey, Deadmau5, Hans Zimmer, Christina Aguilera and Usher to name a few. Starting a guitar lesson business, what’s involved? I believe you will need great production and editing skills. The camera work required to get close to each hand; possibly 2 camera showing the left and right hand simultaneously. We paid £2,000 for my son’s guitar lessons – 50 weeks x £20 per week x 2 years. You have to sell this as an ongoing structured monthly learning and improvement service. You must also sell the benefits of your online service versus the free offerings from YouTube and face to face tutoring. Here’s the keyword research that has identified this opportunity and picked out the weakest competitor. The website ranks for both these keywords with a combined monthly search volume of 8100 searches a month; a drop from 9500 over 16 months ago. The average website in the top 10 gets 2107 visits per month. However this is a big search topic with 4071 same as search terms. So let’s say you can outrank the weakest website above. That’s an annual revenue of £20160 in the first year. Look at the rule of 78 for subscription income. Then there are add on products you could sell; plectrums, guitars, song books; anything guitar related. As per Google Trends, there is a decline in interest in guitar lessons but don’t let that hinder you. The right content with the right teacher will work. I’ve taken a screenshot of the estimated website traffic masterclass.com gets. 1 millions visitors a month. At a 1% conversion rate that website is estimated to generate $900,000 a month. I would imagine the revenue is split between the artist and the website. You will need to invest fairly heavily compared to the other small business ideas I’ve proposed. I would start by building up great website content and get links so you start generating organic traffic. Offer a free lesson in exchange for the users’ email address to build up your prospect list. Or have a coming soon page with an opt-in form. This will ensure you don’t have to invest heavily in production and then no one purchases. Design – you’ll need someone to design course graphics. Recently IKEA purchased a company called Task Rabbit to enable customers to hire handy people to assemble the furniture they purchased. I once assembled a table and chairs purchased from IKEA; it’s not fun. Looking at the following research and questions people type into Google, you can see that furniture assemble isn’t the only problem people have. There’s a chap on Facebook starting a business for ex army and military people seeking careers. If you are a very pragmatic person these keywords could be the fuel to starting a handyman business or website. If you were to rank top 10 for these 6 topics I estimate 12,221 visits per month to your website. I would start with a basic WordPress website and get your content written and created to get some traction in the search engines. Then as traffic builds up you will find out if you get business enquiries or not. The alternative business model, provided you build up enough website traffic, is to offer other websites guest posts or links in exchange for a fee. According to Deloitte research there were 24,000 recruitment companies in the UK in 2015. That’s a rise of 20%. 5000 new recruitment agencies were set up in 2015. There is strong demand in the South of England and London for companies requiring talent employees; particular in the creative, advertising, marketing, IT, games and computer industries. Recruitment is a cut throat, competitive, sales driven industry but don’t let that put off the right type of consultants and entrepreneurs. When you consider recruitment consultancies are paid thousands of £££ by employers to recruit the right candidate for a position, then this is a good opportunity for you to start a successful recruitment business. Who is suited to starting a recruitment agency? Those who set up a recruitment business generally have industry experience. They recognise an opportunity to earn more by starting their own agency or the intensity of working for another is too much. Pre-requisites to starting a recruitment business? You can start up working for home with a telephone line, broadband connection and home office but at some point you’ll need to meet clients and candidates. There are many low cost hot desks and offices to rent in most cities. Ideally you want to stick to the market you know. If I were to start a recruitment business I would go into marketing, advertising, design and development as that’s my area of expertise. I would require training and accreditation; industry bodies such as APSCO and Rec UK can help you. Such accreditation would also bolster your credibility too. The search term ‘graduate jobs” is an easy to rank keyword that can drive a lot of candidate enquiries provided you have employers seeking to fill positions. The search volume has grown from 40500 to85000 per month in 16 months. However the keyword difficulty has made this harder to rank for. Fortunately there are 13401 same as search terms making this a massive topic. I would look into graduate jobs by the name of a degree to find easier to rank options. The internet is going to be at the centre of your employer and candidate acquisition strategy. It’s an investment you need to make in terms of design, research, content, a candidate database, email marketing and linking strategy. We’ve worked with 3 recruitment agencies and we know what they invest and what does and does not work. The other side of the recruitment business equation is finding employers with vacancies to fill. Employers hire recruitment consultants for 2 reasons; speed and ability to offer high calibre talent suited to the roles they offer. Starting a recruitment business is ideally suited to someone who has strong relationship with many employers. You will need to dip into your savings to begin with because you will have many start up costs and must wait a period of time until clients pay their bills. Most recruitment agencies use invoice factoring; you get paid with 3-5 days of invoicing an employer for recruitment fees and they take a share of doing your invoicing and credit control. A recruitment consultant is dependent on companies outsourcing the recruitment process and there are plenty of SAAS solutions being marketed for employers to cut out agencies and hire direct. Google are now the biggest threat to recruitment agencies. Additionally, you will work excessively long hours but achieving a £150,000 turnover and a £90,000 gross profit in the first year is achievable. Doing some basic business maths; if the average candidate salary you place is £40,000 and you charge 15% of the salary then you need to place 25 candidates per year or around 2 per month. I read on the BBC news a few months ago about an America lady who was earning $200k a year as a wedding planner and bridesmaid. The opportunity arose because some brides did not fully trust their bridesmaid to make all the necessary wedding plans so they rent one. It appears she is charging £700 to £2000 depending on the level of service. Definitely suited to an organiser, female, mum. You are dealing with the most important day in a woman’s life. You probably have corporate events experience or you’ve worked in the hotel or hospitality industry where organising is second nature to you. So long as you have a phone, car, laptop and notebook, there are few barriers to starting up as a wedding planner. There is an industry body called UKAWP; the UK Alliance of Wedding Planners. This training and accreditation will give credibility. You’ll need public indemnity insurance and possible wedding insurance; to protect yourself if things go wrong. Notice the monthly searches has dropped from 12100 to 11000 per month over a 16 month period. And the ability to rank has gotten harder. Don’t worry there’s 8260 related searches to wedding planner so opportunities are abound with more research. With London being more prosperous, someone with great people and planning skills could make a very good living from this opportunity and idea. How ever unless you are London based Google will show local listing depending on your location. Let’s look at a competitor pricing; £750 for on the day coordination. Most weddings are on a Saturday so as a business you only have 4 billable days per month. So it would appear this is more a part time opportunity unless you can position yourself as a wedding and events planner. However, there’s a more glamorous side to wedding planning. I’ve been to weddings overseas and friends who have married abroad. Other than start up costs you really have no financial outlay; you are being paid for your time and skills. As I discussed in the event company start up, there’s a lot of adrenalin associated with this career choice. The competitive risks are friends offering to plan their friends wedding or the hotel venue having an organiser. You’re a middle man, a conduit between an event venue and the event hosts. So you have to have a really strong proposition for people picking you. With all these ideas I’ve identified were based on finding easy to rank keywords. But to outrank weak websites you need to create relevant content that is better than anything else out there. After that, you still need others linking to your website. Another approach to marketing the business is to use Facebook advertising. You can target people who have changed their status to engaged. 9.9 million searches a month for tattoo related keywords in the UK. The reverse of having a tattoo is those who regret it and want it removed. Plastic surgeons and skin clinics offer tattoo removal. The business idea is to sell these businesses sales leads you generate for them online. Starting a tattoo removal business selling sales leads is ideally suited to someone with some internet experience; web designer, web developer, SEO or copywriter. Also perfect for a student or someone with a medical background; a stay at home mum with dental or nursing experience. Here’s what you should do if you are interested in starting a business of this nature. You should set up a small website and put together photographs of people before and after the tattoo removal procedure. Your website is going to need to be very medical and professional looking; I don’t have tattoos but I have considered laser eye surgery to correct a damaged cornea. Your website should look like a Harley Street surgeon if you want your web presence to look credible. Do your research and create frequently asked questions about the laser removal process for consumers. name, location, email and details of the tattoos they have. Then you should find a bunch of surgeons or clinics who performs this process and sell them the leads. All you need to do is pull together the top 5 results of surgeons from Google’s local listings or go through the Yell.com website; the data is there. Here’s the research I’ve already done to get your started. Another drop in search volume; from 12100 to 9200 searches per month in 16 months. Sometimes these decreases in monthly searches happen because people learn more about a subject over a period of time. So a search query such as ‘tattoo removal’ in January becomes ‘how much does it cost to remove a tattoo’ in November. That’s why I have included same as terms in this report; and there’s 5183 searches related to tattoo removal. Let’s say you get into the top 10 in Google. You rank on page one and get 1352 visits per month. 5% of people filled in enquiry form. Clinics typically sell tattoo removal at £60 per session but you need 6-10 sessions for the removal to be effective. So at a minimum clinics earn £360 to £600 per client. Sell the lead at 10%. If you sold these leads to clinics for £60 that’s £4020 income per month. There’s been a huge surge in recruitment businesses being set up.I guess the barriers to setting up are low. Recruitment consultants are under a lot of pressure to deliver results for their company so it’s no surprise consultants go out on their own. I’ve pulled together some content ideas for anyone starting a recruitment business or starting a career advice business. With thousands of students graduating in accountancy and law each year some times getting your first foot on the ladder can be difficult. So why not turn your expertise into valuable website content and attract your own clients. There’s huge scope for opportunity here with these keywords. Most existing accountancy and legal practices are too busy serving existing clients to create this type of content. Providing answers to these questions will not result in people bypassing you and doing this work themselves. They are more likely to use your expertise to ensure the work is doing correctly. Here’s the thing about accountants; they are not very entrepreneurial. I could present this opportunity for them to earn nearly 20,000 visits a month to an accountancy resource website and they’d ask me how to minimise the risk. Accountancy services are quickly becoming commoditised as a result of software services. And business owners are crying out for strategic accountants as opposed to number crunchers who fill in forms. Some one will grasp this opportunity I’ve researched; I hope it’s you. My ex wife start a nail technician business a few years ago. She got a partial grant to fund her training and I created her logo, website and social channels. Most of her business comes from Facebook as she lost interest in her website. However when you look at the search volume of these queries, I believe there’s a great opportunity to still use Google to generate new business. When a woman makes a search like these she’s looking to remove nail polish in order to get her nails re-done. So that’s why you should create this type of content if you start a beauty or nail business with your services built around the content. These 3 topics could earn you around 3078 visits from Google a month. This is a huge untapped market for a beautician. I mentioned in another business ideas that ex military and army people found it difficult to get civilian careers. The skills required to lay and fit carpet and flooring are crucial to every homeowner and home improvement business. Creating website content or videos like these would generate a good volume of website traffic. There are different business models you could pursue. Let the customer purchase the materials, you fit and lay. You could pull together a directory of fitters around the UK and charge them. Even just 2174 visits a month from Google by ranking for these topics could start off a good carpet or flooring business. I would spend all day further researching this market. People pay good money for a new garden, patio or decking to enhance their money. When I reviewed these search queries, it would appear people are seeking to learn how to do these tasks themselves; perhaps to save money. A friend of a friend sells astroturf and that’s a very prosperous business to be in; especially in the south of England. Set up website with these guides and offer your services to do this word. Set up an e-commerce website and sell these products; perhaps on a drop shipping basis. Get onto page one for the topics above would represent 13,178 visits a month. That’s a huge asset to leverage and turn into leads and customers. I was approached by a consultant for a curtain company in the summer to re-develop their website. The website was getting zero organic traffic. When you think about the intention behind these 2 searches, you would imagine a person is considering new curtains for their home. The barrier to entry to the curtain business are low and the key to starting is getting customers. It’s not difficult to find product suppliers. So these 2 search queries could be the catalyst to creating content when you start your new curtain website. Best of luck; any questions leave a comment or get in touch. Feel free to download the new business ideas infographic; please credit the source if you use it. Enter your name and emails to download this PDF resource of 27 must start online business ideas.